BRODEUR, LOUIS-PHILIPPE (baptized Louis-Joseph-Alexandre; no explanation has been found for the change of name; he is listed in the 1871 census simply as Philippe), lawyer, politician, and judge; b. 21 Aug. 1862 in Belœil, Lower Canada, son of Toussaint Brodeur, a farmer, and Justine Lambert; m. there 27 June 1887 Emma Brillon, and they had four sons and one daughter; d. 2 Jan. 1924 at Spencer Wood, Sillery, Que., and was buried 5 January in Belœil. Louis-Philippe Brodeur grew up in a Liberal family. His father and his maternal grandfather, Pierre Hébert-Lambert, supported the Patriotes and on 25 Nov. 1837 fought in the battle of Saint-Charles-sur-Richelieu, where the latter was killed. As a result, Brodeur’s childhood was imbued with the memory of these events and it was inevitable that he would throw in his lot with the Liberals. From 1875 to 1881 Brodeur studied at the Séminaire de Saint-Hyacinthe, where his marks ranked him as one of the best students of his year. He then enrolled in the faculty of law at the Université Laval in Montreal and reportedly articled in that city in the law firm of Honoré Mercier*, leader of the Quebec Liberal party at the time. 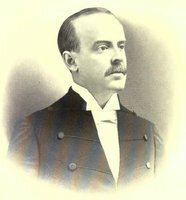 Graduating in 1884, Brodeur was called to the bar in July of that year. He would be made a qc in 1899. The young lawyer first opened an office in Montreal with Edmond Lareau*. He is believed to have also worked with François-Xavier Dupuis, among others. 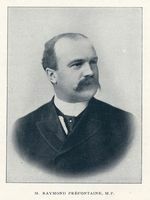 He subsequently made the acquaintance of Raoul Dandurand*, another young Liberal, with whom he went into partnership around the middle of 1891. Brodeur and Dandurand began to engage seriously in politics and they soon attracted attention. Brodeur was invited to be the federal Liberal candidate for Rouville. 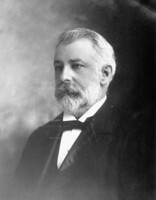 The election of 5 March 1891, which made Brodeur the Liberal mp, marked a turning point in his career. Like many others, he sought to rise through the ranks of the party. While waiting to be offered important political assignments, he wrote the occasional article for L’Électeur (Quebec) and La Presse and La Patrie (Montreal). For La Patrie his contributions would include a series about the Manitoba schools question, praising the settlement reached by Wilfrid Laurier* and Thomas Greenway*. In 1896, with Philippe-Auguste Choquette* and Frédéric-Ligori Béïque*, he founded Le Soir. This newspaper was intended to be the organ of the federal Liberal leader, Laurier, in opposition to La Patrie, the radical Liberal paper of Honoré Beaugrand*. Brodeur was the owner and publisher with Choquette of Le Soir, and a member of its editorial board along with Horace Archambeault* and Christophe-Alphonse Geoffrion*. Founded to spread the message of moderate Liberals during the 1896 election campaign, it proved ephemoral, the last issue appearing on 31 August, after only four months of publication. Brodeur was returned in Rouville in the federal election of 23 June 1896, which brought Laurier’s Liberals to power. Hoping to make his leader’s task easier, he offered to resign his seat to make way for a potential cabinet minister who had been defeated. Laurier would not forget this offer, and when he was selecting his cabinet, he summoned Brodeur to Ottawa. The young mp thought he would have to give up his seat, but during their meeting Laurier offered him the post of deputy speaker of the House of Commons. Brodeur’s increasingly important party responsibilities – writing for the party newspapers and organizing meetings in the province – revealed his abilities. 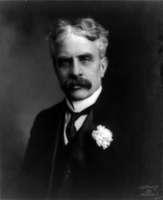 Laurier appointed him speaker of the house on 29 Nov. 1900, and he took up his duties on 6 Feb. 1901. His loyalty to his leader, whose moderate liberalism and respect for institutions he shared, enabled him to rise through the ranks. Late in 1902, after forcing Joseph-Israël Tarte* to resign, Laurier embarked on a thorough reorganization of his party, which he used to reward his most faithful supporters. Thus, on 19 Jan. 1904 Brodeur became minister of inland revenue. He held this portfolio only a short time, for on 6 Feb. 1906, following the sudden death of Raymond Préfontaine*, he was appointed minister of marine and fisheries and given responsibility for the political district of Montreal. At first, Brodeur was Laurier’s man in charge of patronage in the province of Quebec. The lists for handing out favours were among the things he controlled. Then he became an important adviser to the prime minister, as the tasks he would be called to carry out show. In a political system where loyalty to the leader ensured advancement, Brodeur’s devotion to Laurier, combined with his leadership qualities, guaranteed him a choice spot. It was probably at this time that Brodeur began to figure as one of the most prominent Liberals in the province. In 1908 he was responsible for the election campaign for all of Quebec. Early in his ministry he proposed a major reform in the Montreal Harbour Commission and he improved navigation on the St Lawrence by having buoys put in place and getting the shipping lane deepened. Brodeur came to play an important role in strengthening Canada’s stature in international affairs. After the settlement of the Alaska boundary dispute in 1903, an issue in which Great Britain abandoned the colony, Laurier became increasingly convinced that Canada should take charge of its own affairs. An occasion arose in 1907, when the Liberal government decided to negotiate trade agreements with France and Italy. Laurier, who was highly regarded in Great Britain, received the authority to send two ministers – William Stevens Fielding, minister of finance, and Brodeur were chosen – to hold discussions with the two countries, on condition that the final agreement be countersigned by the British ambassador. The negotiations began in France, where Brodeur acted on his own since Fielding spoke no French and the French negotiators spoke no English. This mission was successful; it marked a decisive step forward in trade relations between Canada and foreign countries. In August 1907 the representatives of France and Canada concluded an agreement providing for lower import duties on some products. However, given the duration of the negotiations in Paris and the imminent opening of parliament, Brodeur and Fielding returned to Canada without going to Italy. In recognition of his participation, Brodeur was made an officer of the Legion of Honour in 1908. As minister of marine and fisheries, Brodeur also dealt with the creation of a Canadian navy, which had become a crucial issue given German military threats in Europe. Although the idea had been advanced during the administration of his predecessor, Préfontaine, following the 1902 colonial conference, it was during Brodeur’s term in office that the navy was established. Laurier, Brodeur, and Sir Frederick William Borden*, minister of militia and defence, represented Canada at the 1907 imperial conference, at which a plan for centralizing the naval defence of the British empire was discussed. Like Laurier, Brodeur rejected this plan, maintaining that Canada, which had been responsible since 1885 for its fishing grounds and the Great Lakes, was quite capable of taking charge of the defence of its coasts. In the same spirit, Brodeur wrote to Laurier late in 1908 that the time had come for Canada to pass its own legislation on naval matters. On 29 March 1909, on a motion by George Eulas Foster*, the House of Commons agreed in principle to the creation of a Canadian navy. In August 1909 Brodeur and Borden represented Laurier at another imperial conference. After strong opposition from the Canadian delegates, Great Britain’s first lord of the Admiralty, Reginald McKenna, abandoned the idea of including Canada in his imperial navy. He agreed that Britain should lend two warships and that Canada would organize its own naval defence. In his capacity as minister of marine and fisheries, Brodeur now set to work. The bill to create a Canadian navy was introduced in the House of Commons on 12 Jan. 1910. It provided for Canada to assume responsibility for the defence of its eastern and western coasts, freeing Great Britain from this burden and thereby enabling it to concentrate on organizing its own defence. The bill was attacked on all sides; it suited neither the French Canadian nationalists led by Henri Bourassa*, who had not held a seat in the house since October 1907, nor the English Canadian Conservatives led by Robert Laird Borden*. The former considered the bill too generous towards the British navy, which would be able to make use of the Canadian navy in the event of an emergency; the latter accused it of underestimating Great Britain’s needs. Brodeur was ill and unable to take part in the debate. He was absent on the day the bill was introduced and had to count on Laurier and Rodolphe Lemieux* to defend it. On 4 May approval was given to the act creating the Department of the Naval Service. In all likelihood suffering from serious intestinal ailments, Brodeur stayed out of politics for a good part of 1910, and it seemed his career would soon come to an end. Ill health did not, however, prevent him from accepting responsibility for the new department, in addition to his existing ministerial responsibilities. Moreover, he led the Liberal forces in the federal by-election of 3 Nov. 1910 in Drummond and Arthabaska, where he had to face the Conservatives and Nationalistes led by Bourassa, Armand La Vergne*, and Frederick Debartzch Monk*. 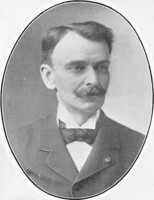 Henri-Sévérin Béland*, the Liberal mp for Beauce, assisted him in this task. The election resulted in a surprise victory of the Nationalistes and a bitter defeat for the Liberals. In mid 1911, Brodeur accompanied Laurier to London for the coronation of George V and the imperial conference. The minister was then in the process of organizing the navy. Meanwhile, in Canada, the Liberals were preparing for the expected election following negative reaction to the reciprocity agreement with the United States [see Laurier]. Brodeur took no part in this election, which proved a disastrous one for the Liberals. Because of his illness, he was physically less and less able to perform all his political tasks. He was also beset by insinuations of corruption, the most insistent coming from Godfroy Langlois, who in Le Canada and Le Pays attacked him for patronage. Brodeur had to resign. On 11 Aug. 1911, the day after he retired from political life and shortly before his 49th birthday, he was named to the Supreme Court of Canada. His was a purely political appointment (the last, apparently, in the court’s history). 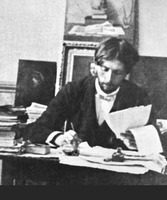 Despite an honorary doctorate conferred on him by the Université Laval in 1904, Brodeur had few accomplishments to his credit in his legal career. At the Supreme Court, Brodeur became the champion of the principles and distinctive features of the Quebec Civil Code. English Canadian judges seemed inclined to read the Civil Code in light of the common law. In a number of judgements, Brodeur reiterated that any analogy of this kind can only lead to serious errors of interpretation. Clearly, he looked at some of his colleagues with a critical eye. On 19 July 1918 Brodeur and one other judge dissented from a Supreme Court decision which validated an order in council authorizing the cabinet to cancel exemptions that the Conservatives had initially granted under the Military Service Act of 1917. Even though the cancellations were upheld, he registered his dissent once again, an event that stood out in a judicial career that was, on the whole, rather uneventful. Illness continued to plague Brodeur and made his life increasingly difficult. In 1923 he expressed a wish to retire because of his deteriorating health and the gnawing arthritis that made it painful for him to write his decisions. When his mind was made up, his Liberal friends did not forget him. 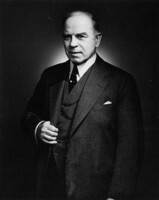 First among them was Prime Minister William Lyon Mackenzie King*, to whom Brodeur had been very helpful during the transfer of power after Laurier’s death in 1919. On 19 Sept. 1923, in the company of Fielding and Charles Murphy*, King reached the decision to offer Brodeur the post of lieutenant governor of Quebec, and he went to his home to put the proposal to him. Surprised but grateful, Brodeur accepted. For him, this appointment was a confirmation of the esteem in which he was held by his Liberal friends and former colleagues. He resigned from the Supreme Court on 10 October and was sworn in as lieutenant governor on the 31st. From about 1906 until his enforced retirement from public life in August 1911, Louis-Philippe Brodeur had been, next to Laurier, the most important Liberal in Quebec. He had successfully managed the provincial Liberal machine, which had played a decisive role in the survival of Laurier’s various governments, and he had done so always in harmony with the leader’s thinking. 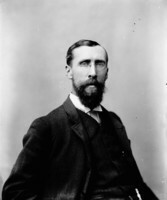 A front-line fighter in the quest for Canada’s diplomatic independence, he had been responsible for the first purely Canadian international trade negotiations. As the man responsible for the creation of the navy, the forerunner of the Royal Canadian Navy and the Royal Naval Canadian Volunteer Reserve, he had linked his name with a great national institution. Illness abruptly brought to an end the accomplished career of one of Laurier’s most trustworthy lieutenants. [Material concerning Louis-Philippe Brodeur is held in various repositories. Collections at the NA include Brodeur’s own papers (MG 27, II, C4) as well as those of Victor-Gabriel Brodeur (MG 30, E312), William Lyon Mackenzie King (MG 26, J), and Wilfrid Laurier (MG 26, G). At the ANQ-Q, information on the final weeks of Brodeur’s life is provided in the diary of Denis-Benjamin Papineau (P569), the lieutenant-governor’s aide-de-camp. Brodeur’s papers at the ANQ-M (P64) include letters, photographs, and five scrapbooks of newspaper clippings; in addition, this repository holds his baptismal and marriage records (CE601-S49, 23 août 1862, 27 juin 1887). Interesting details are also found in the memoirs of Brodeur’s friends and contemporaries: L.-O. David, Souvenirs et biographies, 1870–1910 (Montréal, 1911), and Raoul Dandurand, Les mémoires du sénateur Raoul Dandurand (1861–1942), Marcel Hamelin, édit. (Québec, 1967). René Castonguay, “BRODEUR, LOUIS-PHILIPPE (baptized Louis-Joseph-Alexandre; Philippe),” in Dictionary of Canadian Biography, vol. 15, University of Toronto/Université Laval, 2003–, accessed April 26, 2019, http://www.biographi.ca/en/bio/brodeur_louis_philippe_15E.html.